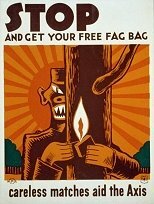 This selection from the Library of Congress's By the People, For the People: Posters from the WPA, 1936-1943 is not quite as politically incorrect as one might think. Events in history that ARE politically correct, are purely the creation of the spin-doctors. "These primary historical documents reflect the attitudes, perspectives, and beliefs of different times. The Library of Congress does not endorse the views expressed in these collections, which may contain materials offensive to some readers." I am in agreement on the kudo's. Too many organizations lose their nerve and end up presenting a very white-washed (pun intended) version of the past. I'd rather have the truth. Or if its not the truth, then make it weird fiction!